This week I'm loving moody fall shades, cocktails with girlfriends and lots of incredibly lovely support during wedding planning. I've found the whole experience quite challenging, despite my best attempts to be "cool" (that's probably what's throwing me off...), and those of you who have listened, consoled and conspired have helped me more than you know. Now for some loveliness! This garden wedding is impossibly pretty. This fête is a fall classic–I can't wait for cider and cashmere! This winter celebration is terribly chic. I am head over heels for this romantic fall wedding. PS–Oscar de la Renta gowns for every celebration. 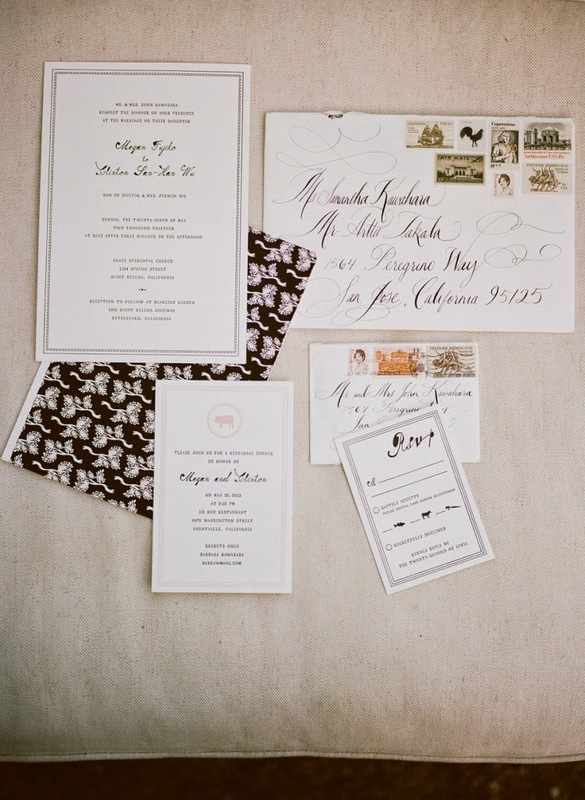 Image by Meg Smith, stationery suite by Mr. Boddington's Studio. The classic fall wedding - my favorite. It's so original and yet so elegant. p.s. if you need any help, please get in touch! My friends tell that I'm good at planning events, and I love weddings. Joyti, I just saw your incredibly sweet note–how generous of you! We'll have to chat about it this weekend!